WHAT IS THE LAW SURROUNDING CAR ACCIDENTS? Download "WHAT IS THE LAW SURROUNDING CAR ACCIDENTS?" 3 If I m stopped at a red light and somebody rear ends me at a red light, it is their fault as they failed to stop. They hit me in a rear. There is nothing I can do to avoid that accident. That person will likely be found to be 100% at fault. What If I m Behind Them and They Stopped for No Reason? This situation is certainly an argument for mixed liability. If a person stops inappropriately in the middle of a fast moving highway for instance, without an emergency or perhaps a mechanical failure, it would be hard to explain that as reasonable under the circumstances. However, when you re driving a vehicle, you have a duty to know what it is in front of you and leave plenty of space for a certain stop for a vehicle in front of your vehicle. 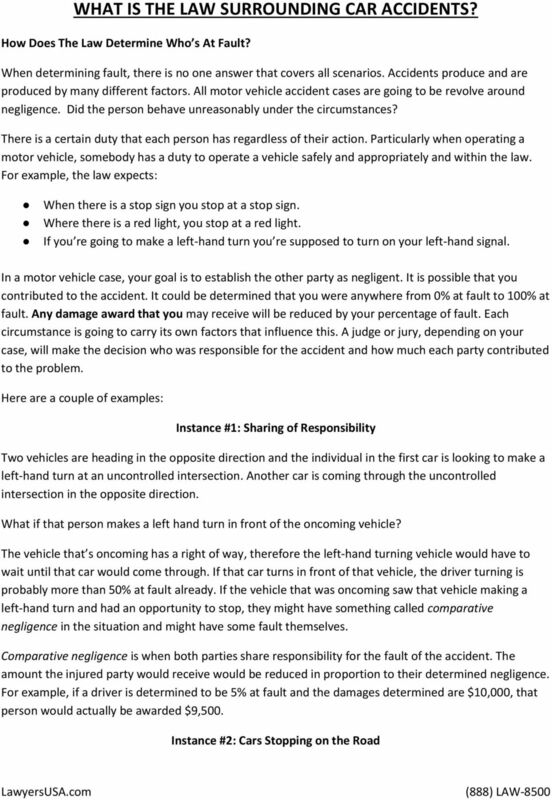 While this most likely will involve mixed liability, anytime you re rear-ending somebody you will most likely bear a larger percentage of fault. 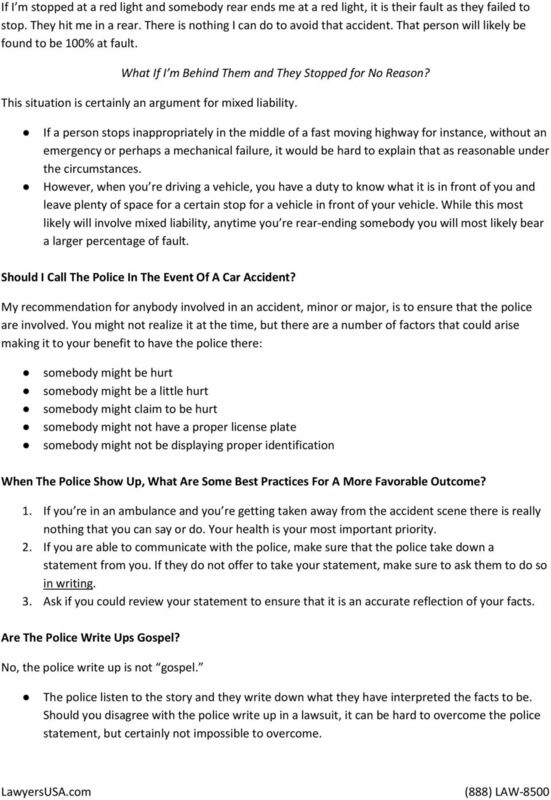 Should I Call The Police In The Event Of A Car Accident? My recommendation for anybody involved in an accident, minor or major, is to ensure that the police are involved. You might not realize it at the time, but there are a number of factors that could arise making it to your benefit to have the police there: somebody might be hurt somebody might be a little hurt somebody might claim to be hurt somebody might not have a proper license plate somebody might not be displaying proper identification When The Police Show Up, What Are Some Best Practices For A More Favorable Outcome? 1. If you re in an ambulance and you re getting taken away from the accident scene there is really nothing that you can say or do. Your health is your most important priority. 2. If you are able to communicate with the police, make sure that the police take down a statement from you. If they do not offer to take your statement, make sure to ask them to do so in writing. 3. Ask if you could review your statement to ensure that it is an accurate reflection of your facts. Are The Police Write Ups Gospel? No, the police write up is not gospel. The police listen to the story and they write down what they have interpreted the facts to be. Should you disagree with the police write up in a lawsuit, it can be hard to overcome the police statement, but certainly not impossible to overcome. 5 on notice of an accident as well. You cannot assume that this is being done for you. Failure to put insurance companies on notice could compromise the rights you have under those insurance policies and could expose you to additional personal liability. What You Can t or Shouldn t Do: 1. Regardless of fault, there s nothing that you can do to control whether or not somebody is going to bring a lawsuit against you. 2. You should cooperate with your insurance company. Do not give them an opportunity to disclaim any kind of protection that exists on your behalf. If you re injured, you should also speak to an injury attorney who can advise you on how to move forward and protect your rights. What Are Some Common Injuries Or Symptoms To Look For After A Car Accident That May Indicate That You Sustained Some Serious Injuries? Immediately Obvious Injuries: laceration, cuts, bumps, bruises, obvious fractures, serious limb damage, and anything else that could be assessed easily. Non-Obvious Injuries: These are more complicated and are what we describe as soft tissue injuries. Soft tissue injuries will often involve a spinal injury where your body has moved rapidly back and forth. This could involve slamming forward into the dashboard, the steering wheel, or the seat in front of you and then snapping back very quickly. Soft tissue injuries could also arise if you had an airbag deploy at you that might have pushed you back very quickly. Injuries that Show Up Later: We frequently hear people complaining of neck pain or back pain that might not manifest itself right away. It might take a day, it might take two days, and it might take five days or longer for those symptoms to show up. What s the best thing to do? In the event that you ve been in an accident and you feel some pain in your body, go to the hospital or the emergency room and get yourself checked out. You never know what might have happened to your body. It s possible that you to have a serious injury that you re not recognizing right away. It s always a good idea to get your body checked out by going to some kind of medical provider. Make sure that you articulate exactly what it is that s bothering you. Should I Call An Attorney If My Neck Is Sore Today, But It s Going To Get Better? Sometimes your neck, or other pains, will get better quickly. It is true. But a lot of times your neck gets worse. 7 It Is Your Right: Holding somebody accountable for their negligence is by no means an insult. It s a right that you can to exercise and in many instances a right that people should exercise in the event that they ve suffered a serious injury in a motor vehicle accident. That is What Insurance is for: Motor vehicle owners are required to have insurance for exactly these circumstances. Serious Injuries Should Be Compensated: If you ve been serious hurt in a motor vehicle accident, it could be life changing. Many times people cannot return to their normal life. The only way to make people as whole as possible is by getting compensated for their injuries. It Makes Sense to Protect Yourself. Calling an attorney is one step you can take to protect yourself. It is your right to do that. It s your right not to do it as well, but time can go by and you could lose that opportunity to file a lawsuit. How Do I Protect Myself If I m Sued? Report the accident to your insurance company immediately. If you ve received a summons and complaint, if you ve received a claim letter from an attorney, or a claim letter from an individual saying that they wish to make a claim against you, call your insurance company without delay. You may also want to consult with your own private counsel to see what potential personal exposure you may have. Will Suing Someone Cost Me Anything? No. Injury attorneys don t charge by hour, but instead charge by a contingency fee. A contingency fee means that a legal fee is only payable upon the success of a case. In most instances, the attorneys shoulder any expenses associated with the case and get their expenses and fees only in the event that they are successful on your behalf. They are paid a percentage of whatever they recover for you. 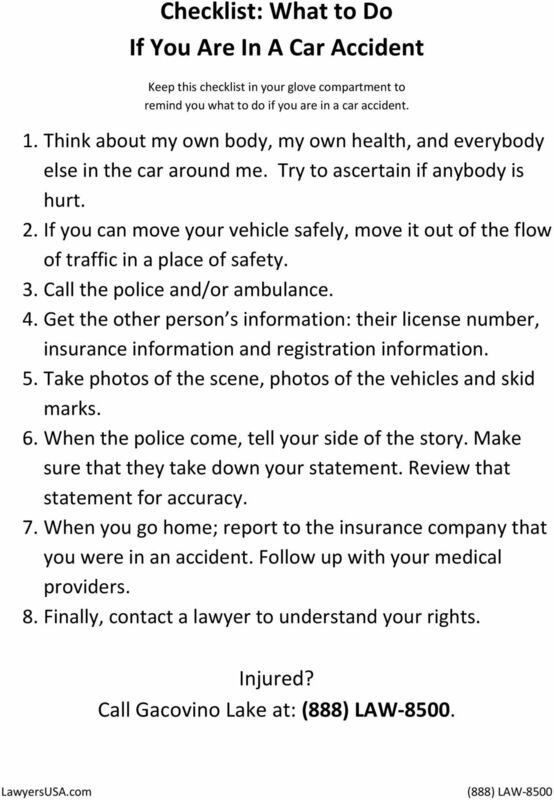 8 Checklist: What to Do If You Are In A Car Accident Keep this checklist in your glove compartment to remind you what to do if you are in a car accident. 1. Think about my own body, my own health, and everybody else in the car around me. Try to ascertain if anybody is hurt. 2. If you can move your vehicle safely, move it out of the flow of traffic in a place of safety. 3. Call the police and/or ambulance. 4. Get the other person s information: their license number, insurance information and registration information. 5. Take photos of the scene, photos of the vehicles and skid marks. 6. When the police come, tell your side of the story. Make sure that they take down your statement. Review that statement for accuracy. 7. When you go home; report to the insurance company that you were in an accident. Follow up with your medical providers. 8. Finally, contact a lawyer to understand your rights. Injured? Call Gacovino Lake at:. 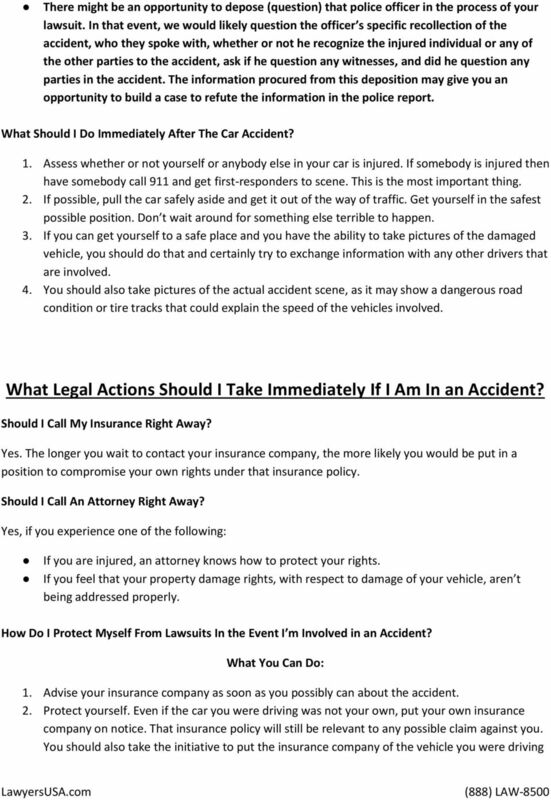 WHAT SHOULD I DO IF I HAVE AN AUTO ACCIDENT? 1. If I have an auto accident, do I have to stop? 2. What should I do if someone is injured? WHAT HAPPENS AFTER A FLORIDA CAR ACCIDENT? Myburgh Attorneys HAVE YOU BEEN INJURED IN A CAR ACCIDENT? 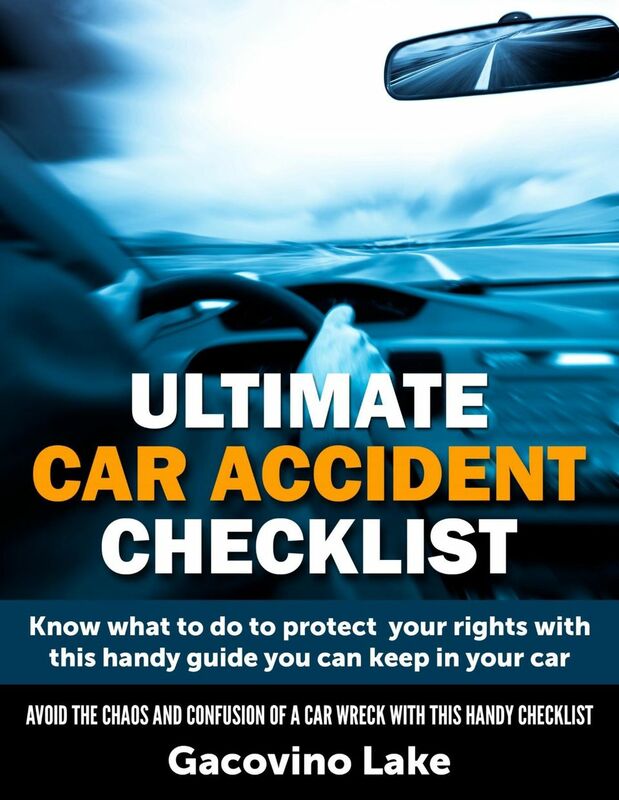 DO YOU KNOW SOMEBODY WHO HAS BEEN INJURED IN A CAR ACCIDENT? WHAT ARE YOUR RIGHTS? 1. What s the difference between Limited Tort and Full Tort Auto Insurance Policies? Is What You Know About Injury Claims Accurate? Consumer Federation of America s Guide to Navigating the Auto Claims Maze: Getting the Settlement You Deserve You ve just be involved in a fender bender with another vehicle. Your car is damaged but drivable. What is a definition of insurance? 12 Common Auto Accident Myths: Protecting your rights and wallet after being injured in an auto accident. Journal. A workbook designed to organize and survey your incident & injury throughout the road to recovery. tywilsonlaw. 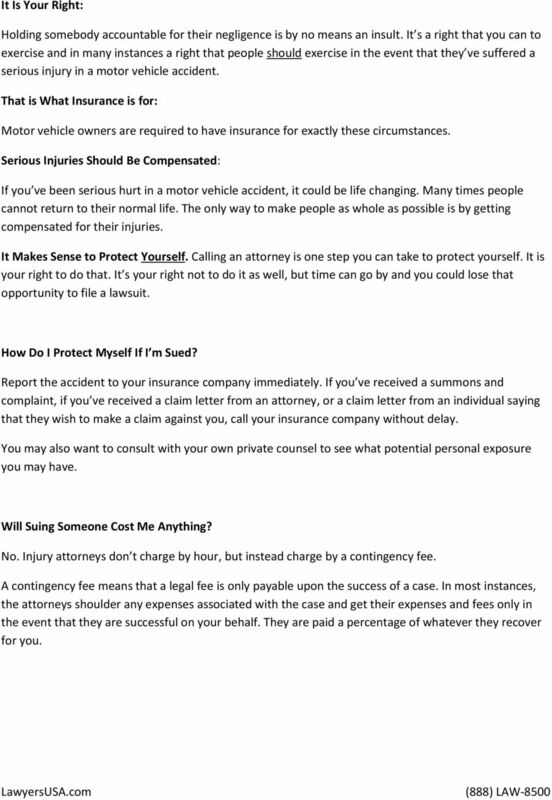 A CONSUMER'S GUIDE TO AUTOMOBILE INSURANCE IN MARYLAND 1. Peter J. Basile, Shareholder Ferguson, Schetelich & Ballew, P.A. Personal Injury? What to Do? CHILDREN S INJURIES. There is never any attorney fee until your child s case settles. 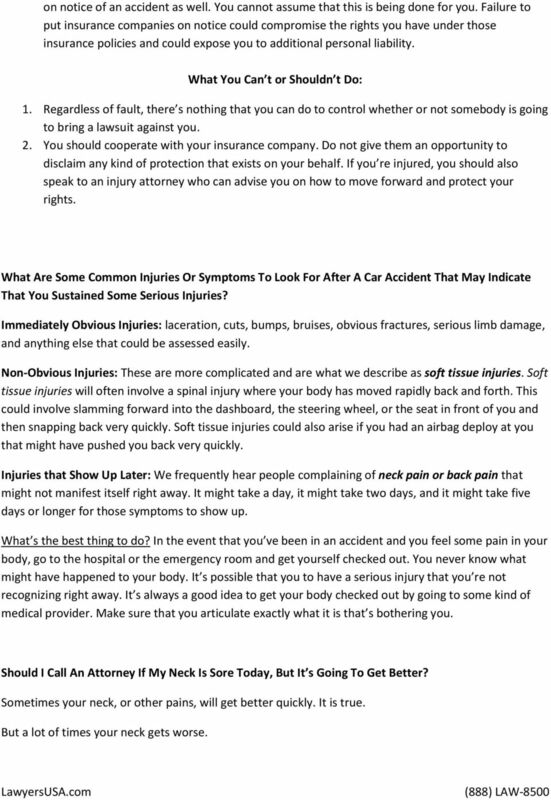 WHAT TO DO Immediately After Being Involved in an Auto Accident BY EDDIE E. FARAH & CHARLIE E. FARAH, ATTORNEYS AT LAW If a person is seriously injured, do not move them unless they are in imminent danger. 3 TRAPS THAT INSURANCE ADJUSTORS WILL SET FOR YOU..
3 TRAPS THAT INSURANCE ADJUSTORS WILL SET FOR YOU.. 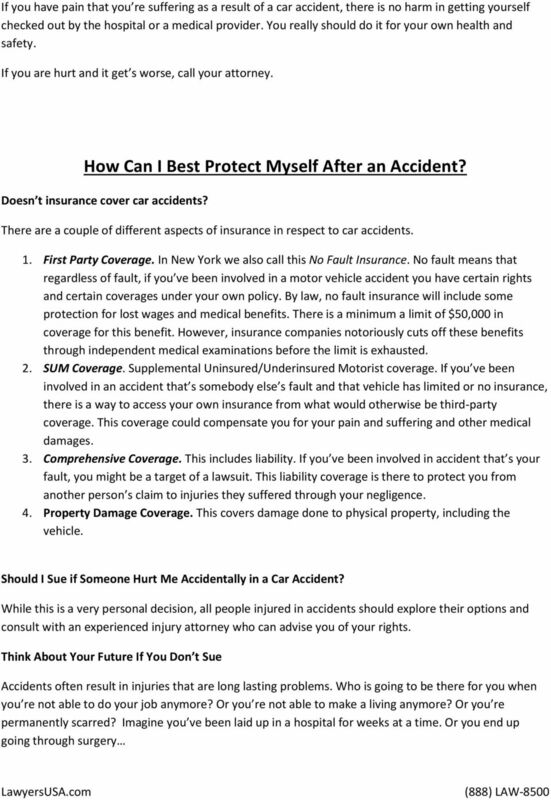 BUT READ THIS FIRST (AND CAREFULLY): You may be like many people who are in car accidents who want to try and handle your insurance claim on your own. Cycling and the Law: Know your Rights! FREE SPECIAL REPORT WANT TO PROTECT YOUR FAMILY? WHAT YOU ABSOLUTELY, POSITIVELY HAVE TO KNOW WHEN BUYING CAR INSURANCE. Consumer Awareness How to Keep From Getting Ripped Off by Big Insurance Provided as an educational service by: Anthony D. Castelli, Esq. Concentration in Auto and Work Related Injuries (513) 621-2345 ATTENTION!!! The insurance company is also responsible for reasonable towing or storage charges on your vehicle until you receive written notice otherwise. The Insurance and Whiplash Guide I Hope You ll Never Have To Use But If You Do You ll Be Glad You Read This First! A sentence or two of copy goes here, giving a general overview of what s included in the kit. WEEKLY SAFETY MEETING All Euramax Subsidiaries ACCIDENT REPORTING. Safety Meeting Contents. Meeting Notice. Leaders Guide.